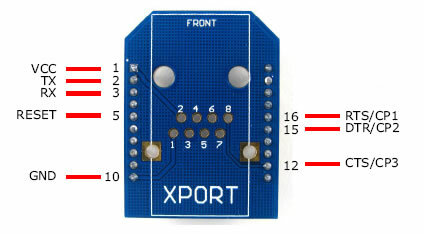 This is a simple board for the XPort module from Lantronix. 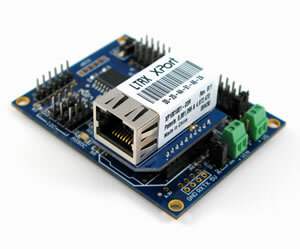 This is a simple board for the XPort module from Lantronix. The XPort and XBee modules have similar specifications in terms of voltage (3.3V) and serial voltage level (3.3V). 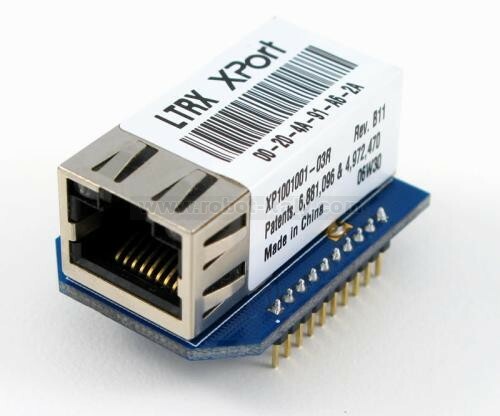 Soldering a XPort module on this board, you obtain an ethernet to serial module to install in almost every XBee application. Your wireless applications become ethernet enabled in a few seconds. You can easily switch from XBee to Xport and backward. The CP2 pin is routed to the ASSOC pin of the XBee, since most of the XBee boards have a LED, you can use this pin to lit the ASSOC LED for various purposes. 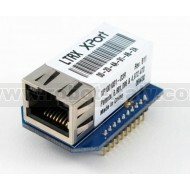 The XPort module is not included. RJ45 ethernet jack with built in transformer (magnetics), status LEDs, and shielding.